Ultimate FireTV is a really nice build for Kodi v18 Leia found in XOne Wizard. Jesusbox Repo houses this wizard and much more; check it out if you haven’t yet. It’s been in our list of best Kodi repos since we started the list. If you have a Fire TV, or even a Firestick, you may want to try the Ultimate FireTV build on it. The Fire TV skin used by the Ultimate Fire TV build is a favorite skin to many experienced Kodi users. Ultimate Fire TV build contains Movies, TV shows, Paid TV, Trakt, Favorites, Programs, and Settings categories. It also has a great search function that lets you find available streams from any of its many great Kodi addons. It is highly recommended to always use a VPN when streaming with Kodi for privacy and security. Try the IPVanish VPN app right now, which is the most Kodi and Firestick friendly VPN app available, and enjoy their risk-free 7-day money back guarantee. IPVanish VPN have an app for your Firestick and Fire TV that will allow you to safely surf the web and stream anonymously from wherever you are with no restrictions. Note that this build is only going to work properly when installed on Kodi 18 Leia. The interface, features, and options will not line up with those available in older versions of Kodi. It’s also necessary to enable unknown sources within Kodi 18 before installing Jesusbox repo, XOne Wizard, or Ultimate FireTV build. This has been true since the release of Kodi 17 Krypton. 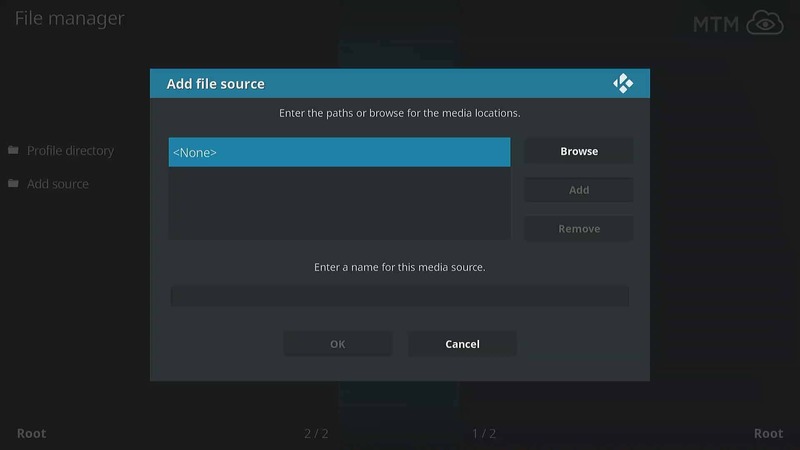 From the Kodi v18 Home screen, click the Settings icon. Double check for errors and click OK to save. From here, we install the XOne Wizard. This Kodi addon is what we will use to install Jesusbox repo itself along with the Ultimate FireTV build. Go back to Kodi Home screen and click Add-ons in the menu. Click on the Add-ons browser (AKA Package Manager). Select the jesusbox resource saved earlier. Click on the plugin.program.XOneWizard.zip file. You should quickly see a notice with XOne Wizard Installed appear, then the wizard will start automatically. The XOne Wizard will install the Ultimate FireTV build along with all the necessary Kodi addons. The wizard also installs the repositories required to keep everything updated, including the Jesusbox repository. Select what you’d like to keep and/or clear, then click the Continue button. Click the Build Menu button. If you choose to ignore this, you can run the XOne Wizard at any time from the Kodi Add-ons area. Choose the Ultimate FireTV build for installation. Click on Standard Install if you are installing Ultimate FireTV build on a clean installation of Kodi 18. I’m using Fresh Install here, which factory resets the Kodi installation first. It’s always safest to choose Fresh Install. You must click Continue to restore your Kodi configuration to default settings before being allowed to install Ultimate FireTV. Ultimate FireTV build downloads and is currently less than 300 MB. After download, it unpacks and installs, currently taking up just over 400 MB on your Firestick, Fire TV, XBox One, or other Kodi 18 Leia device. Choose to Force Close Kodi, which will allow the Ultimate FireTV build to fully take over the user interface upon next startup. When next you start Kodi 18, Ultimate FireTV should finish its installation. Be patient as it builds menus and updates all of the included add-ons and scripts. Don’t forget to start up your IPVanish VPN app and connect to an encrypted VPN server for the main event. The first thing you will likely want to do after installing this build is remove the non-working cruft. To name a few things you’ll want to get rid of, Ultimate FireTV includes Colossus, Q’s, and UKTurks repositories. You’ll want to replace these with some of the best working repos available today. After this, you’re going to want to install some great Kodi addons. After all, the real reason for any great looking Kodi build is to enjoy streaming entertainment. This is a very great build once a few Kodi addons are changed out!